Making a presentation simple requires hard thinking. You might be concerned that in your quest to make your presentation simple, you’ll dumb it down. In this post I want to show you the difference between dumbing down and true simplicity – and how you can achieve true simplicity in your presentation. 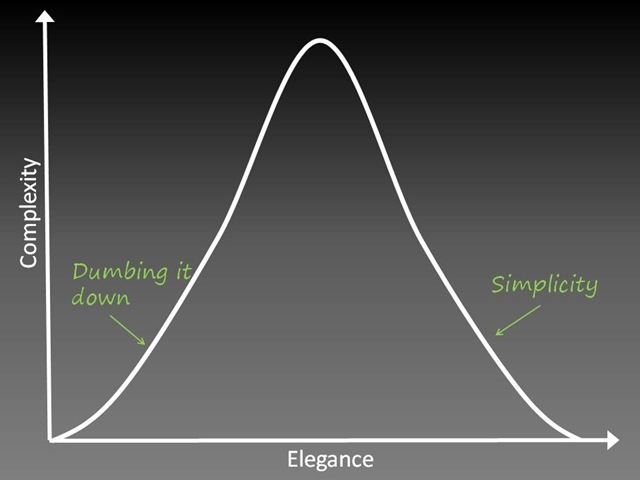 To differentiate between the two types of simplicity, I’ll call the “easy” simplicity – dumbing it down. Here’s an example of the difference between the two from my passion: horse-riding. As a child I had riding lessons. One of the hallmarks of a good rider is that their heels are down. So my teacher would shout at me “heels down, heels down!” I would do my best to jam my heels down and end up with a stiff, tense body that did nothing for my horse-riding. 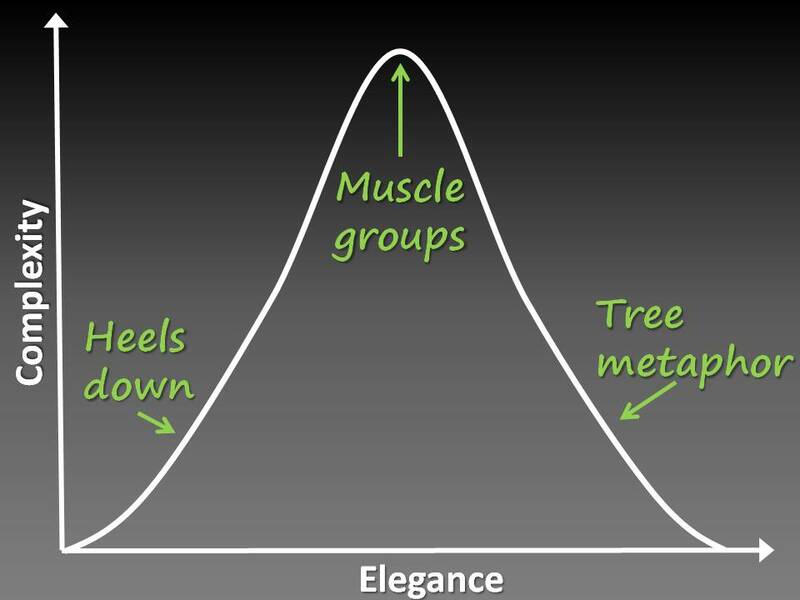 But the low heels of the good rider are a product of the way they sit on the horse, not a product of jamming their heels down. My teacher was dumbing it down so much, she lost the essence. But if she had tried to explain the point in full, she would have needed to refer to my muscle groups and how they all needed to work together – it would have got very complex. Imagine you’re like a tree with your roots sinking down into the ground and your branches reaching up into the sky. That would be simplicity on the other side of complexity. That simplicity is elegant. Simplicity is a complex undertaking. You cannot reach simplicity without understanding the complexity and subtleties of your topic. Your job is to make the complex easily graspable to your audience by arriving at that simplicity. The core of your idea is the core of your presentation. Express that core in one simple and specific sentence – I call this the key message of your presentation. To find out how to develop and craft this sentence, head on over to this post How to craft a memorable Key Message in 10 minutes. Notice that the last example is both simple and specific. However, don’t get hung up on ensuring that every nuance and subtlety are expressed in the key message (lawyers and scientists – I’m talking to you). You cannot include every legal caveat or scientific qualification in your key message – or even in your spoken presentation. Put these into a handout. In some topic areas, there’s a choice between being 100.00% accurate or being understood. BTW, if you think that talking in complex language makes you look clever – check out this post 8 Studies demonstrating the Power of Simplicity. One way to make sense of complexity is to find the patterns and make a model. Models are incredibly sticky – because they help people understand the world. For example – there are many models relating to human personality styles. These models help us make sense of the huge variation in personalities and help us get along with people who are different from us. Chunking – chunk ideas/factors/items that have a commonality together. Show what they have in common. Show where they differ. Sequencing – Put the items in an order that makes sense. The order could be chronological, or it could be going from a 30,000 ft view to a microscopic view of your topic. Venn diagrams – A Venn diagram is great for visually demonstrating the overlaps and differences between items. Flowcharts – construct a flowchart that enables your audience to see the process and clearly identify the decision points. Check out this demonstration of making the complex simple De-cluttering spaghetti charts from Jan Schultink’s blog. What tips do you have for arriving at simplicity? Lots of this makes sense to me. My own way at arriving at simplicity is to ask myself “What do I want my audience to feel?” This has to be the core of any presentation for me. When they feel something, they might well be moved to take an action. And always, keep it simple and understandable. That’s a very useful question to ask when you’re preparing your presentation. It helps you focus on what’s important. Very important and relevant post. Thank you. There is language that is easy to understand and yet rich and colorful enough to carry meaning and emotions across, between kindergarden speak and convoluted, pompous, scientific jargon. I love the Saint-Exupery quote. Thank you for adding that. And I like your point that the language exists. I really like the Holmes quote and how you brought it to life through your visual. Thank you. Someone who really understands a complicated idea can explain it simply. Someone who doesn’t, will tend to make it even more complicated. Thanks for stopping by and for your appreciative comment. And it’s an excellent point you’ve made. Great post, Olivia! I’m always coaching presenters to err on the side of simplicity, and ideally, of simple elegance. It’s so much harder to confidently ‘wear’ a simple, little black dress of a presentation than one with lots of metaphorical bows and feathers stuck on it. Hmm…I wonder what sort of presentations Audrey Hepburn made? Glad you enjoyed the post. Love your dress metaphor – although I did get a bit stuck imagining you in a little black dress! HA, Olivia! Sorry for that visual…although, imagine the confidence it would take for me to pull that off. I’d consider it a presentation challenge. Just like powerpoint slides, your words should be clean and simple. Buzz words, jargon and long endless explanations don’t impress your audience. These words lose them! Excellent explanation. I said something similar more briefly in this post about Why Less is More – or even less: http://joyfulpublicspeaking.blogspot.com/2010/03/why-less-is-more-or-even-less.html Kiwi Red also used to fly Skyhawks. I enjoyed your post on “Less is more”. Great post. We work with a lot of authors who have to condense their often complex books into simpler speeches. I begin by explaining to them that books and speeches are two different genres. Speaking is not a great genre for detail (specificity, yes, but not oodles of detail); it is a great genre for persuasion. So we ask, what is it that you want your audience to do differently as a result of the speech? Put that in one sentence, and you know what you’re talking about. Thanks for your appreciation of the post. I totally agree with you that it’s useful to have a clear understanding about what a presentation is good for, and what it isn’t. I also explored this point in my post about information overload.